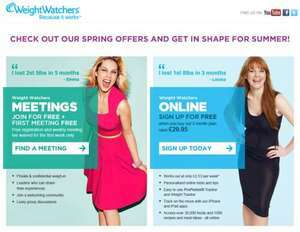 Quidco are currently paying £30 cashback when you sign up to 3 month registration at Weight Watchers (99.2% tracking success). The cost for 3 months regisatration is £31.85. After quidco it is only £1.85. I have posted the link for quidco so it doesn't affect anyone's tracking. why is this cold??? sounds great! My advice is read up and do a low carb diet. Quidco tracked after about an hour, not sure why this is cold? Lots of people need some motivation and monitoring to help them lose weight. Here's some advice for free. You should NEVER EVER EVER go "on a diet". Diets imply a temporary fix to a problem. What do you think happens when you have lost the weight? You'll think 'job done' and chances are go back to your previous eating patterns. It doesn't take a genius to work out what happens next. You absolutely do not want to go on a diet. What you DO need is a complete overhaul and lifestyle and dietary change. This is a lifelong change that will yeild lifelong results. There you go, that's free. Right ok, I don't need a lecture on diets, just posting a deal. I am sure people can make their own minds up as to What is best for them.